During a recent Oracle Meetup in Paris, I met Martin Bach and Bertrand Drouvot. Martin was here to present on Application Continuity, and we had an interesting discussion about this technology. (Bertrand had recently published an interesting post about Application Continuity in a Dataguard configuration … here). In the post, I will explain quickly how it works based on an sample code I wrote few months ago. I will explained too application continuity resources allocation, where they are consumed, and how much is the resource overhead. 12c Application Continuity … What is it and how does it work? Application Continuity is a technology that will improve application availability. Before Oracle 12c, Transparent Application Failover (TAF) or Fast Connection Failover (FCF) coud help you to improve application availability without downtime, but developers usually have to implement a TAF or FCF aware code. And usually, it’s wasn’t the case for many reasons (testing and UAT platform which weren’t RAC platform, specifications weren’t written in this aim etc.). In 12c, Oracle releases application continuity. This technology will do the same thing with more simplicity and has been developed to handle planned and unplanned outages. a 12c (12.1.0.2) RAC Cluster with a container database (CDB), a Pluggable Database (PDB), and a Database Schema (LAURENT) with on 2 tables and a “spy” trigger. a small Java Code sample. Note: I voluntarily configured the service with a preferred node to be sure It will be always the same I will use for my tests (related to resources). But I recommend you to configure it with all instances as “preferred”. The Java source code is available at this link. pressAnyKeyToContinue: it’s a private method that make a pause during the program. 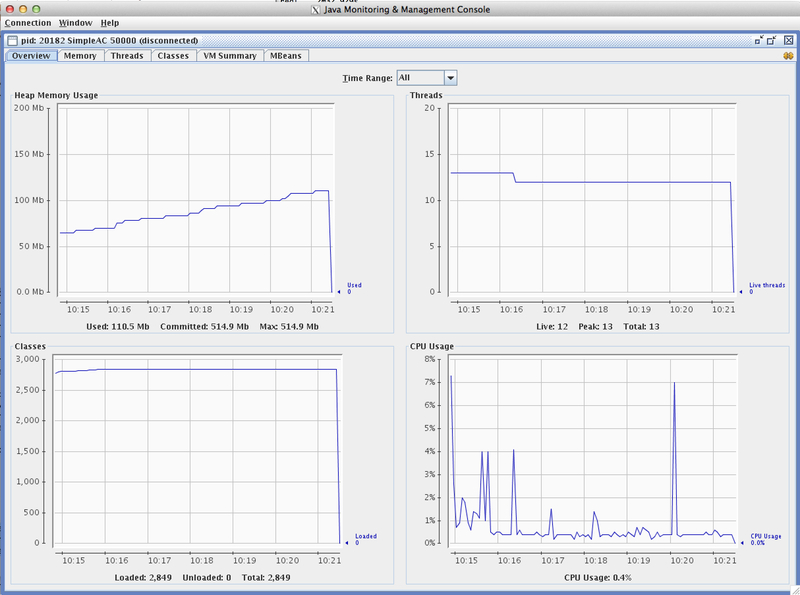 This pause can be useful to attach a JConsole or VisualVM to track JVM memory and CPU. getStatValue: this function returns the value of an oracle statistics for the current session. call the prepareStatement function to assign the SQL statement, otherwise you will throw a SQLRecoverableException during the connection failover. disable autoCommit for the connection. put a commit statement to say where the transaction ends. * AutoCommit has to be disabled in the callback part. // End of the Callback. In the main function, the most important thing is to use the new OracleDataSourceImpl class instead of OracleDataSource. Then, I compile the code and run it with the number of updates I want to execute in my transaction. We can see that, even with an instance failure which was running a transaction (of 50000 updates), the failover occurs without any error message. This proves that the transaction has been rolled-back and completely replayed after the connection failover. When a transaction becomes replayable, a problem comes with what we call a mutable value. If you are interested by the definition you can read this on wikipedia: http://en.wikipedia.org/wiki/Immutable_object. But I prefer to explain this in a different way. Imagine we do a close test to the previous one, but instead of updating data, we insert lines into a table and in this table, we have a timestamp column which takes the value of systimestamp oracle function when we insert a line. Now an outage occurs, the connection if failed over and the transaction is rolled back and replayed on the other node. If we don’t say to Oracle that this value is immutable, the value will be inserted at the timestamp recorded on the second node and not the original one and this could cause some problems in your data integrity. This problem occurs with sysdate, systimestamp, sequence values and another function that depends on your process id (and other parameters) : SYS_GUID. No pain, no gain … what about resources consumption? Application continuity is a good thing because, with less code modification your java app will become completely fault tolerant. As the documentation mentions, there’s an overhead on CPU and memory … then, let’s check this ! To test this, I used the same environment than previously but I didn’t kill any process, I just ran it with and without callback definition. 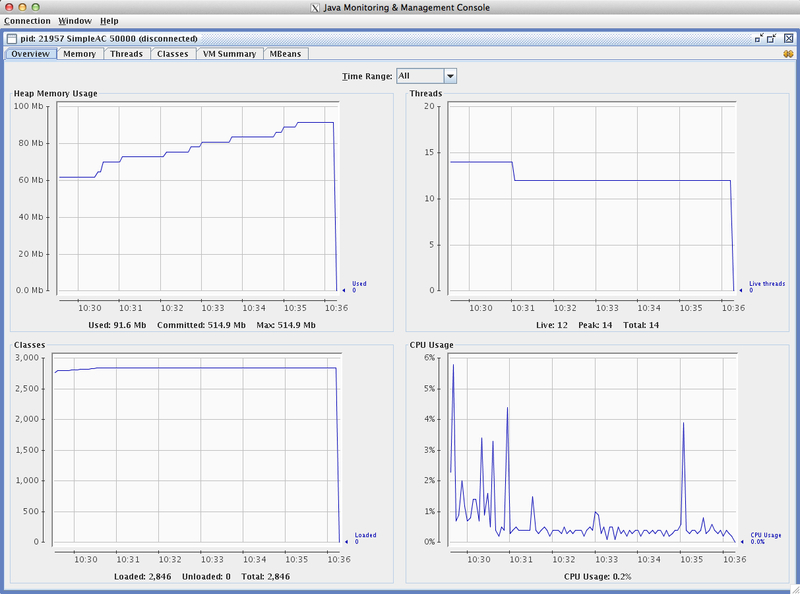 CPU and memory consumed by the java program has been measured with this good old Jconsole. To get the java heap memory usage, I set up the program with a heap size of 512Mb as it was the good value to avoid garbage collection during execution. The Heap usage high water mark is 91Mb and the average CPU is 0,2%. To sum up, we can tell that there is a memory overhead on the jdbc layer (for my example which was based on a transaction of 50000 updates). The CPU overhead announced by Oracle seems to be trivial. On the database side, no overhead has been found on CPU nor on the memory.